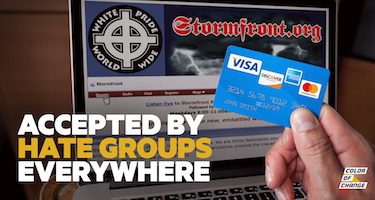 The big payment processing companies - Visa, MasterCard, American Express and Discover - are processing funds for some of the vilest white supremacist groups. Including the groups behind the racial terrorism in Charlottesville. White supremacist hubs like Stormfront are able to easily receive funding from their members because these companies are allowing them too. And thanks to transaction fees, these companies are making money every time someone donates to these hate groups. Some of the groups receiving money from Visa, MasterCard, American Express and Discover are responsible for numerous hate crimes, murders, and the radicalization of terrorists Dylann Roof, Timothy McVeigh, and Wade Michael Page. These companies have all cut off other hate groups in the past, it’s time for them to step up and cut all white supremacist groups from their financial resources. Enough is Enough. Immediately cut off hate groups from your payment processing services. White supremacist groups like Stormfront have played a major role in the recent and rapid rise in anti-Black, anti-Jewish and anti-LGBTQ hate crimes in the last year and a half. Through these groups, they plot to turn their hatred into violence. Stormfront users have been disproportionately responsible for some of the most lethal hate crimes and mass killings since the site was put up in 1995. In the past decade alone, Stormfront members have murdered close to 100 people. Other hate groups, like Label 56, Crew 38, National Alliance and Northwest Front have been responsible for the radicalization of terrorists like Dylann Roof, Timothy McVeigh, and Wade Michael Page. By profiting from donations to hate groups you are directly enabling the rising violence and vitriol directed at marginalized communities. Our communities will not stand for any corporations that aim to make a buck off white supremacy. Take immediate action and cut hate groups off from your financial service platforms.